reetings, dearest ones, it is I KUAN YIN who comes and in truth, I never leave and so it is with all of those who you call Masters. We are here within this idea that you call the White Star Temple, always, for without form it is possible to be here and elsewhere simultaneously. Wherever we turn our consciousness to, so there we be. Once you reach the higher spectrum, the beauty is that your consciousness can be in many places at once. It is difficult, from a human perspective, to integrate the idea that you can simultaneously be taking in many places of 'being' at once but it is possible. It comes not as a fragmentation, rather it comes in waves that I cannot describe. It is the tiniest similarity to when one is in the presence of the Divine where there is an explosive, multilayered expression of meaning. This is the tiniest reflection of this; where many layers of being can be experienced at once. I come not for this purpose of explanation. I am amongst most beautiful beings for I am amongst Divinity and as I cast my gaze upon each, so it is, that the vibration of you is changing before my eyes. This means that change is coming into your third dimension for you and you have an opportunity to welcome it. It is time to begin to contemplate service. As mastery begins to integrate into your human consciousness it is timely to remember that 'mastery' is but a term for those who take upon themselves a greater responsibility in service. So then, it could be timely if you wish it, to initiate directions of service. For some it will be a continuation but perhaps a new level of experience, capacities, insights, skills and opportunities. For others, it may be new directions entirely – it is what you call in. As you become more aligned with the higher aspects of self, so it is, that higher guidance will come and this is to be welcomed. It is exciting, yet as with anything within your physical realm you must initiate it. One must place the foot forward for the path to become known and open before you. For, the path does not exist until you place your foot forward. Spirit operates spontaneously within the Eternal Now which is ever-changing, ever in flux and is part of the divine chaos. As such, that which is to be put in place before you is only ever put in place when it is absolutely timely. The next step then, that you take upon the path after the first step, reveals itself only as that step is being taken and so on. In this way we allow for the spontaneity of existence, Creation and Divine Thought and guidance. This is why you must not place too much store upon the future or future pathways, for they are not formed and the Divine Mind will not give you what is not in the moment. Once you begin to take that step into either a greater arena of service or a different direction, then Divinity will make the path smooth and what a blossoming it shall be. I am always at your service and I send outward from me, my radiance, love, wisdom, blessings and the joy of knowing that Divinity moves through me. The Divine Signature is upon me. So, I send this celebration into your hearts so that you may celebrate your uniqueness. Kuan Yin encourages you to initiate service within your life. Mastery simply means taking on a greater responsibility in service. Tune into your higher self for guidance regarding your service. Spirit operates spontaneously within the Eternal Now and only brings you what is in the moment. As such, the next step on your spiritual path only appears when you are ready. As Mastery begins to integrate into your human consciousness it is timely to remember that 'Mastery' is but a term for those who take upon themselves a greater responsibility in service. 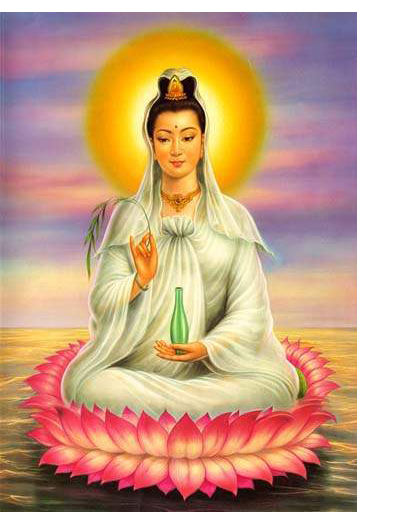 Kuan Yin is a well loved Chinese Goddess who is also an ascended master. She is known for her great compassion for humanity with divine mother energies.